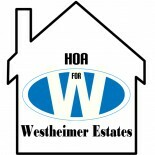 2013 Dues and updates | Homeowners Association for Westheimer Estates, Inc. The Westheimer Estates HOA wishes you a continued prosperous Happy New Year. The HOA, with your participation, would like to help you improve your property value and quality of living for 2013 and the coming years. To meet this goal we would appreciation your timely submission of your HOA dues. As always, HOA dues are due within the first 45 days of each New Year. As we quickly approach this deadline date, we wanted to also offer additional options to help those of you who are not able to make one lump sum payment of $195.00 for the year. We are happy that our dues have not changed for 2013. HOA dues remain $195.00 per year. If you have submitted your annual dues, thank you. If you have not submitted your dues, please take a moment remit your payment as soon as possible. To avoid a late payment fee of $25.00 (which is in accordance with Article I. Section 6, Page 3 of the Westheimer Estates Covenant), please submit your payment of $195.00 by February 28, 2013. In order to bring our HOA up to today’s technology we have created a website where we can share information with each other. This website can also be use as a resource for our community. Please take a moment to visit our website at http://www.westheimerestates.org. Let us know what you think and share your comments, concerns and suggestions. Also included is a payment plan sheet. If you would like to set up a payment plan please fill out the payment plan sheet and send it along with your first payment to the address above. Please scroll down to find link to a copy of the payment plan for you to print. there were far more sites similar to this excellent one on the word wide web. As the Secretary of my Homeowner Association in Fort Collins, it’s sometimes a challenge trying to maintain work, family and my HOA duties . However, when I discovered Association Online all of that changed. No need to worry about piles of paperwork, their software is quite easy to use and all our HOA documents are stored and managed online. This allows our Board of Directors to operate in a more effective way. You should check them out at http://www.associationonline.com or call (970-226-1324). I highly recommend them for all Homeowner Association needs. This entry was posted on February 12, 2013 by Westheimer Estates in Communication, HOA and tagged dues, hoa, westheimer estates.